Well, I'm finally settling into this Brooklyn space - adjusting to the fast, working bee pace. Despite all my inclinations to live in rural, beautiful places - I'm finding that I really like big city living. Maybe it's my internship, which is a constant source of inspiration everyday, or maybe it's enlivening to be surrounded by so much culture, constantly. Little interactions make it- connecting with someone while waiting for the subway, making new friends at music venues in Manhattan, biking to work in the morning and watching how the landscape changes, block by block. Whatever it is, I'm into it. I could see myself sticking around here long after my internship is completed. Anyway, this here was one of the last cakes I made in my Modern Pastry Design class. With all the crazy that's been going on these last many weeks I haven't gotten around to posting it, but I can't just not share it! It was such a delicious combination of things, and the white chocolate honey comb took sooo long to perfect. Makes enough for three 6" pans! I. Preheat oven to 325 degrees. Place parchment circle in cake pan and then oil the pan. II. Put paddle attachment on standing electric mixer. Cream together the butter, flour, sugar, baking powder, baking soda, salt, and chamomile. Mix on medium speed until the mixture looks a bit like grated parmesan cheese - sandy but not clumpy. III. Whisk together remaining ingredients. Pour 1/3 of wet ingredients into the dry mixture. Continue to blend until the wet has just incorporated. Pour another 1/3 and repeat until all the liquid has been incorporated. Then beat on medium high for about 2 minutes. IV. Pour batter into prepared cake pans. Fill each until it is about 2/3rds full. Bake cake for 25 -25 minutes, or until skewer comes out clean. Allow cake to cool. I. Preheat oven to 450. Heat a roasting pan while the oven preheats. Peel and pare the pears. Cut each half into 4 large chunks. Add the pears into the pan and then the butter. Roast for 10 minutes then add the honey and the cardamom and bake until the pears have begun to caramelize. Cool the pears and then puree them in a food processor. 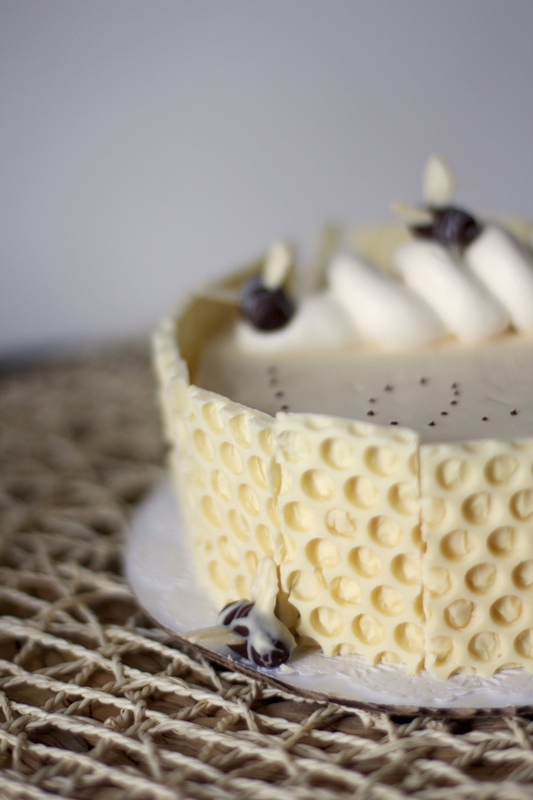 The cake is iced with Caramelized Honey Italian Buttercream! All this means is that I took a classic Italian Buttercream recipe - like this one for example and added caramelized honey too it! Caramelized honey is exactly what you think it is, and oh man it makes such a difference in flavor. All you do is add about 1 cup of honey to a saucepan, heat it and stir it until the honey is rich, dark amber color. Whisk it into the Italian Buttercream and there you have something that is delicious, and easy to spread! Now, all you have to do is put your cake together! Take each layer, soak it with a bit of chamomile simple syrup - equal parts sugar and water steeped up with a few chamomile tea bags. Spread an even layer of pear filling on each layer, and then ice it with your caramelized honey Buttercream! To make the little bees: Make chocolate paste, stick almond slices in for wings, and then drizzle melted white chocolate on for stripes - and there you have the cutest little bees! It's an involved cake, but the accents are just so cute.